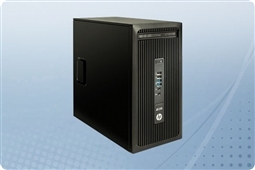 HP Z238 Microtower Workstations are the best compact desktop workstation solution for creative professionals and engineers that need the top tier of performance and reliability from their HP workstation PC! Made to keep up with even the most demanding workloads, the HP Z238 workstations come fast processing from either the Intel Core or Intel Xeon family of CPUs, up to 64GB of DDR4 memory, and compatibility with both SATA as well as SSD storage. Additionally, with graphics customization options to choose from you can upgrade your HP Z238 tower workstation to include the best in processing power from names such as NVIDIA and AMD for your most graphically intensive creative tasks. Plus, HP Z238 workstations deliver design you can trust to hold up in mission critical environments due to extensive testing and validation testing, ensuring your hardware will stand the test of time! Aventis Systems proudly provides a an Essentials parts replacement warranty standard on all of our HP Z238 Microtower workstations with upgrades to Express Next Day parts replacement, Extended term, and Secure Drive media retention warranties available where more support is needed. Looking to get your workstation fast? Upgrade to Rush Build on your product and expedited shipping at checkout to control when your order arrives! So check out our products below buy the best in compact business workstations today with the HP Z238 Workstation from Aventis Systems!